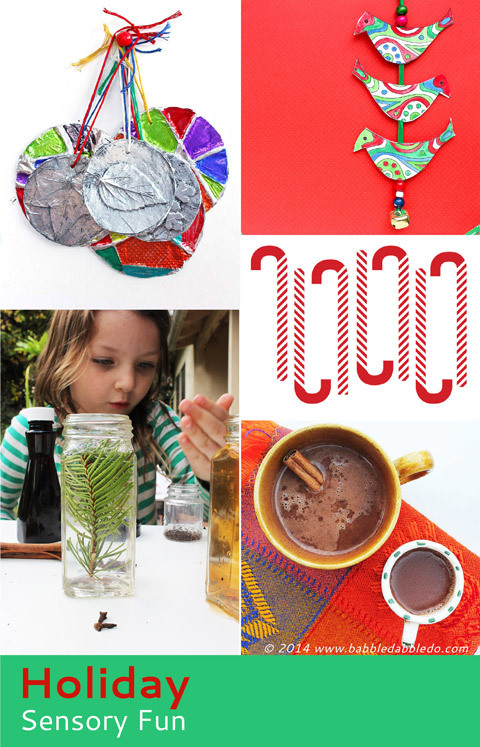 Christmas craft ideas are everywhere right now and there are so many amazing ones! So we are throwing our hat into the mix with today’s project: Holiday Bell Tota. These little ditties are part of fabulous Christmas Sensory Series I’m a part of too! Read on for more about the series….. This is the second project in the Christmas Sensory Series for kids that I am participating in along with 5 other amazing blogs: Childhood 101, Picklebums, Toddler Approved, Meri Cherry, and Nuturestore. Each week we will be exploring one of the five senses, today we are exploring SOUND. Last week we explored SIGHT. If you didn’t catch part one hop over here to see our Holiday Optical Illusions and links to 5 other fun projects related to the sense of sight. One of the things that always reminds me of the holidays is the sound of bells. And I have been itching to make a Bell Tota for sometimes now, so I decided this was the time to do it! What are Bell Tota? 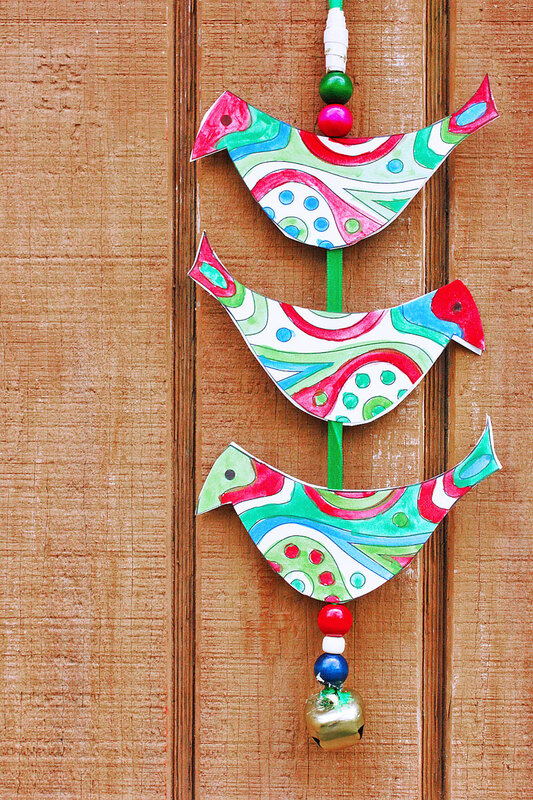 Bell Tota are a tradition in many Indian households; they are a decorative strand of birds with a bell on the bottom that hangs on the back of your front door to welcome guests. They look like this. Since the holidays are a time of getting together with family and friends I thought this would make a fun Christmas project and the welcoming sound of bells is perfect for our sensory series. Think of it as an ongoing sensory delight! Paint & Paint brush or markers- We used my favorite new art supply to color these. Note: You will want to print out two copies of the template of your choice so you have enough for 3-4 birds. Each bird has two sides. 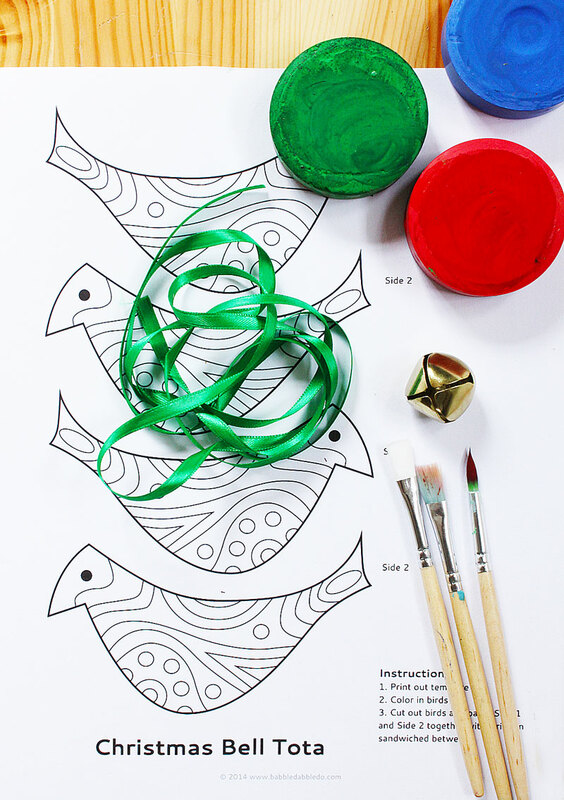 There is a template with decorations or a blank bird template for you to choose from. Step One Print out the template here. Step Two Paint or color in the bell tota template. Let dry as necessary. Step Three Cut out the birds. Step Four Cut an 18” length of ribbon. Thread one end of it through your bell and tie a knot to secure the bell in place. Step Five Place one of the birds FACE DOWN on your work surface, cover it with glue from a glue stick, place the ribbon down the center of the bird, then press another bird on top of the ribbon. You are sandwiching the ribbon between two birds. Step Six Repeat this with other birds. If desired string beads in between the birds OR at the top and bottom of your ribbon. Step Seven When you are done gluing on the last bird tie a loop at the top of the string to hang it from your door. Or tape it to your door- it’s very light! Frank Capra. A bell and Christmas….what does that remind you of? If you are thinking what I am thinking you just said It’s a Wonderful Life, one of the most beloved holiday movies ever, not to mention my husband’s favorite movie of all time. It’s a Wonderful Life was directed by Frank Capra. Did you know that the movie was a box office disappointment ? Now it’s a classic film and the sound of bells at Christmas has become a tradition I look forward to every year. Capra idealized American life and his films can even be said to have started the “feel good” movie genre. His other famous films include Mr. Smith Goes to Washington, It Happened One Night, and You Can’t Take It With You. So when you are looking for Christmas craft ideas why not make a fanciful and welcoming Bell Tota? Every time you hear that bell you will think of the lovely traditions of Christmastime: friends, family, love, and thankfulness. Fill your child’s life with more art, design, and science! Spread creative ideas like wildfire: Pin them!